NavSmart.info falls into the category of browser hijackers as it alters your browser settings upon arrival. It spreads online in freeware and shareware bundles. The hijacker affects all popular browsers including Mozilla Firefox, Internet Explorer, Google Chrome, and others. It not only modifies your preferences, but also causes other disruptions like inserting ads, causing redirects, and more. These activities disrupt and slow down your browsing speed considerably. If you wish to go back to uninterrupted online surfing, you will have to get rid of NavSmart.info. It is possible that you do not remember adding NavSmart.info to your browsers, because it uses the bundling distribution method, which allows it to enter systems unnoticed by the users. Therefore, you should always be attentive when it comes to installing free software. You can decline the additional offers by choosing the Advanced installation mode. If you do that, you will be able to avoid browser hijackers and other potentially unwanted apps. 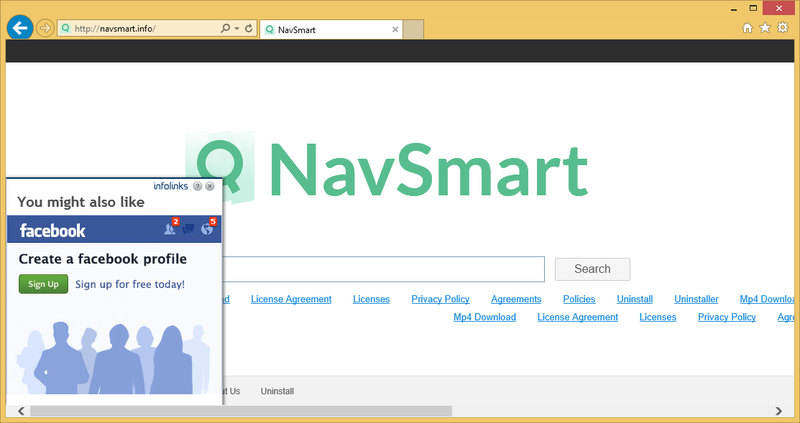 Once the hijacker takes over, it switches your home page and default search engine to NavSmart.info. The site presents you with a search box, quick access links, and date and time. Although these features may be useful, you will notice plenty of others that are not. The hijacker will show you ads in your search results and on other pages that you visit. You should avoid the advertisements, because they are not monitored by anyone. Clicking on them could lead to serious consequences including malware infections, bogus products, data loss, and so on. Please note that the hijacker uses tracking cookies, so some of the ads may appear to be especially beneficial, however, that still does not mean that they are legitimate. If you wish to get rid of them and thus improve your online safety level, you should terminate NavSmart.info right away. You can eliminate NavSmart.info from your browsers manually or automatically. If you choose manual NavSmart.info removal, you will have to complete the following tasks: uninstall the hijacker’s related app and fix your browsers. Instructions below the article can help you with this process. The alternative solution is to erase NavSmart.info automatically. It is the more reliable option, because it allows you to remove other potential threats as well. If you download the utility from our page, it will scan and clean your PC. In addition to NavSmart.info removal, it will also provide your computer with online protection, so it stays shielded from other online infections at all times.